These bright Yellow Flags (Patersonia umbrosa var. xanthina) occur throughout the south-west. They are part of the iris family and are also called day lilies as each flower only lasts a day. 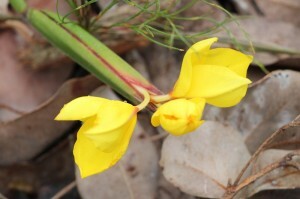 All the flowers are packed into the sheath at the top of the stem.